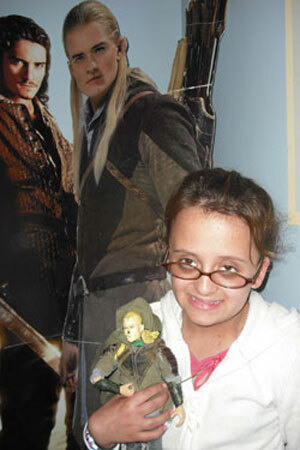 A movie fanatic since she can remember, Lauren has decided to share her love of the big screen productions by authoring “Lauren’s Movie Reviews.” A self-proclaimed Orlando Bloom fan she has designed her own “Leggies” rating system based on Bloom’s character, Legolas, in the Lord of the Rings. A nine year old boy named Cole Sear (Haley Joe Osmet) lives in Philadelphia with his mother. Cole does not get along with other kids at school and gets into trouble because of his strange behavior. One day Dr. Malcolm Crowe (Bruce Willis), a psychiatrist, comes to help him. Cole finally tells Dr. Malcolm his secret – he sees dead people everywhere. Dr. Malcolm believes that Cole is mentally disturbed. While he is helping Cole, Dr. Malcolm is experiencing some strange things in his own life. His wife acts like he is not even there. This movie is very suspenseful and thrilling. It is also a little scary due to disturbing scenes of dead people. I even jumped at one scene. It has lots of twists in the plot which makes for a very unexpected ending. I give this movie 4.5 Leggies. Ever since I heard about the movie The Secret Window I started to ask people who have seen it what it was about and how they liked it. Most said it was very good so I really wanted to watch it. My friend Nishy said it was terrible but he thinks most things are awful. He even calls a Milky Way a poor man’s Snickers. Mr. Mort Rainey (Johnny Depp) lives in a cabin in the woods lone while writing a story. One day a man named Mr. Shooter (John Turturo) goes to Mort’s house and tells him that he stole his story. After Mort and Amy (Maria Bello) get divorced a lot of weird things start to happen. A young teen, Tracey Turnblatt and her Mom, played by John Travolta, and Dad (Christopher Walken), live in a small apartment. Tracey dreams of becoming one of the ‘Nicest Kids in Town’ on the Corny Collin’s dance show. She also happens to be in love with Link Larkin (Zac Effron) who has a bratty girlfriend named Amber. Amber’s mother (Michelle Pfeiffer) is even worse. This movie takes place in Baltimore in 1962. This was a time of great discrimination and segregation. My favorite part is when Link tells his teacher to ‘kiss my ---!” and gets sent to detention. John Travolta is totally hysterical as Edna Turnblatt, a laundress. You would never know it was him. I liked this movie because it is a musical. It is funny and colorful, filled with great costumes and sixties style hair dos. I give this movie 5 Leggies because of the music, costumes, hair and funny characters. The first time I saw this movie was when I was staying at Ronald McDonald House in Philly during my radiation. They had so many old VHS tapes that I never saw. My Mom said that Moonstruck was a classic and she thought I would like it. The characters in the movie all speak with the same accent as my Mom’s side of the family from Long Island. I give this film 5 Leggies. PS – My Amper CAN’T STAND Nicolas Cage. She says he is disgusting, and refuses to watch any movies with him in them. Amps – what did Nicolas Cage ever do to you? I went to see this at the theater with my cousins on our vacation to the Outer Banks two weeks ago. It feels like I have been waiting way too long for this to come out. It was worth the wait! Daniel Radcliff is now 16 year old Harry Potter and is off to Hogwarts for another suspenseful year. The plot has many scary scenes and the special effects astounded the audience. When the skeletal beings came out of the water my cousins put their hoodies over their heads and plugged their ears. I give this film 4.5 Leggies. Viewers beware…. you’re in for a scare. Carol Ann’s role did not fit her age but she played the part well. The story line was “way out of hand” and the scenes were cheesy, especially the mirror scenes, which were “awful.” I give this 1 Leggie with 2 thumbs down! This is a new animated movie that I went to see in the theater with my Dad and sister Grace on Father’s Day. As a young boy, Mr. Fredrickson always wanted to fly but never had a chance until after his wife died. His journey begins as he converts his house into a hot air balloon and goes to South America. Along the way he encounters many characters including Doug - my favorite! His voice changed through a magical collar. It was a HA-HA-HA funny film, but not as funny as the Pink Panther. I still give it 4 Leggies because it has a great story. Steve Martin plays Inspector Clouseau who is wacked out of his mind. In this comedy, you will crack up while he does wild and crazy things as he tries to find the Pink Panther diamond. I LOL as I saw him drop the globe out of the building and it knocked all the bikers off their bikes. 1Leggie – Pitiful; not for human consumption. I wouldn’t even let my baby cousin sit in front of it in her exersaucer. 2 Leggies – Better off cleaning your room - your mom will be happy and you won’t waste any of those precious brain cells (believe me people on this one, I know what I’m talking about here). 3 Leggies – It’s raining; none of your friends are around, why not? There are either a couple of decent scenes or dogs are a central theme in the plot. 4 Leggies – Definitely worth your time. You’ll probably memorize a few lines of dialogue and use them in daily life, claiming them as your own. 5 Leggies – Must see! I’ll be adding this to my collection, watching it over and over, and pushing it on everyone who comes to my house.